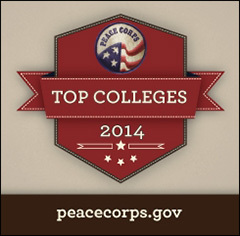 The Peace Corps has released the 2014 rankings of the top volunteer-producing colleges and universities across the country and the SUNY College of Environmental Science and Forestry ranked No. 2 among small schools nationwide, with 17 undergraduate alumni currently volunteering worldwide. This is ESF's first appearance on the annual Peace Corps' Top Colleges list. In the past two years, the school has seen a 143 percent increase in undergraduate alumni volunteers, jumping from 7 alumni volunteers in 2012 to 17 in 2013. ESF alumni currently serve as volunteers in Cameroon, Ethiopia, Fiji, Jamaica, Kenya, Liberia, Madagascar, Malawi, Mexico, Panama, Senegal, Sierra Leone and Zambia. They work in sectors including agriculture, education, English and health. "The same passion that launched the Peace Corps more than 50 years ago fuels progress in developing countries today thanks to the leadership and creativity that college graduates bring to their Peace Corps service," Peace Corps Acting Director Carrie Hessler-Radelet said. "The unique Peace Corps experience helps recent graduates cultivate highly sought-after skills that will launch their careers in today's global economy." Since the first days of the Peace Corps, 164 ESF alumni have traveled abroad to serve as volunteers. "While earning my degree, I was taught to approach things with an analytical frame of mind," said Matthew Thornton, an ESF alumnus who is currently serving as a Peace Corps volunteer in Ethiopia. "This has proven valuable when deciding which projects to undertake and how to go about developing and implementing them in the most sustainable fashion possible. "Peace Corps was one of the best decisions that I have made in my life and I wouldn't change a thing," added the Honeoye, N.Y. resident, who graduated from ESF in 2009. "It is no surprise to see such a strong ESF representation among current Peace Corps volunteers," said John Turbeville, assistant dean for student affairs at ESF and director of career services. "Students' engagement on the ESF campus and surrounding community is an indicator of their future involvement in these life-defining career opportunities. ESF students' passion for environmental issues is both a motivator for their commitment to service as well as a driving force behind what they chose to become involved with. The pledge to address an environmental issue is part of what identifies an ESF student." In 2013, New York State was ranked as the No. 2 volunteer-producing state in the nation, with 420 Empire State residents currently serving overseas. Service in the Peace Corps is a life-defining, hands-on leadership experience that offers volunteers the opportunity to travel to the farthest corners of the world and make a lasting difference in the lives of others. Peace Corps volunteers live and work at the community level and promote a better understanding between Americans and the people they serve, while at the same time becoming global citizens. When they return home, volunteers bring knowledge and experiences that give them a competitive edge for 21st century jobs and advanced educational opportunities. They give back to their own communities and enrich the lives of those around them, helping to strengthen international ties and increase our country's global competitiveness. The Peace Corps has eight regional recruitment offices across the United States that work closely with prospective volunteers to ensure that all Americans who want to serve have the opportunity to do so. The Northeast regional recruitment office serves ESF, and Peace Corps recruiters are based throughout the region. Find the recruitment office near you by visiting the Peace Corps website. The Peace Corps ranks the top volunteer-producing colleges and universities annually according to the size of the student body. Below are the top five colleges and universities in each category and the number of alumni currently serving as Peace Corps volunteers. A list of the 2013 Top Colleges and Universities can be found here.